Want to protect your vehicle from stone chips whilst driving in London? Here at Creative FX (based in South East London), we use the strongest and clearest films on the market to stoneguard your vehicle from chips and minor abrasions. Creative FX PPF treatment is a long-lasting, clear urethane film designed to protect even the most vulnerable of painted vehicle surfaces. This means that you can keep your vehicle in show room condition year after year, without the expense of stone chip repairs. Guaranteed to remain optically clear, it may look like nothing, but that’s the point! London based Creative FX are the capital’s premium vehicle car wrap and paint protection company. Creative fx are approved Xpel paint protection film installers. Xpel paint protection film patterns are cad drawn and text fitted before installation. This material uses special Elastomeric Polymer Technology that allows the film to heal itself from minor scratches or swirl marks in a matter of minutes. Creative FX PPF stone protection film is great for track days and sporting events. It’s been tested in extreme on and off road conditions and is used by top race teams within Formula One, FIA GT, NASCAR and A1 Grand Prix. Full front ends from £910.00 + vat. If you own a car, and especially a brand-new car you will want to take care of it and keep the paintwork in as best condition as possible. As soon as you are out on the road even the smallest of stone chips hitting your vehicle paint at speed can cause damage leaving it looking less beautiful than when it left the showroom. What if you could protect your vehicle’s body paint without anyone noticing? 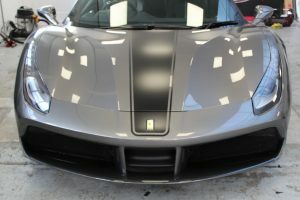 At Creative FX in London we are experts at installing professionally fitted XPEL paint protection film on cars. These films are practically invisible , and all XPEL’s products involve a self-healing technology. Clear PPF wrap can be used to cover a whole vehicle’s exterior including spoilers, bumpers, hoods, trunk ledges and doors. This means the vehicle will be protected against adverse weather. We have over 15 years experience in the installation of paint protection film on cars and vehicles. If coatings are applied to stone chip protection the look of the car will be improved, plus it is water repellent and will not be damaged by using shop sold cleaning products. Stone chip protection and stone guard clear paint protection film wrap are just two of the services and products we offer, please give us a call for a quote or more information.